Yes, my cinnamon addiction is showing again. 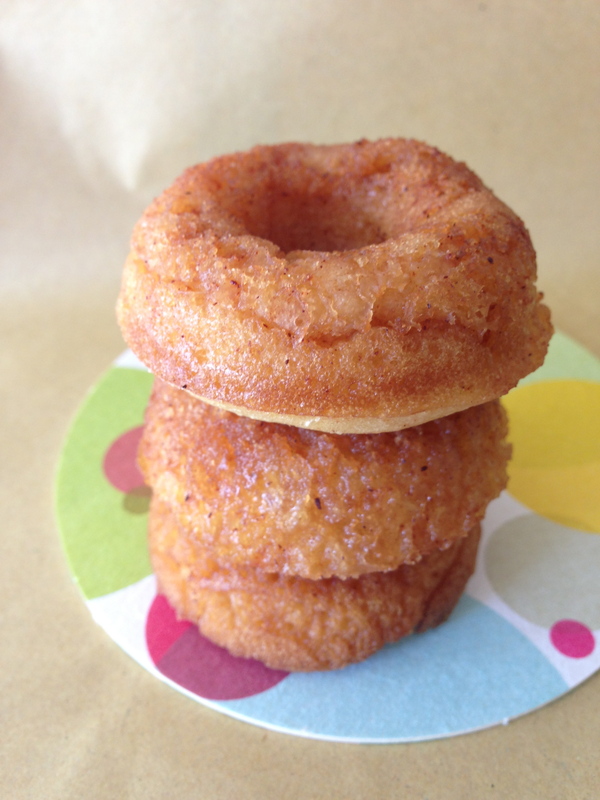 Many moons ago I blogged cinnamon donuts but since buying a mini donut pan on our trip to San Fran last year I’ve been going baked donut crazy! I found a wonderful recipe on Tidy Mom’s site and reduced the sugar and upped the maple syrup. If you can’t get your hands on maple syrup I’d suggest switching it for something else – maybe golden syrup. Imitation anything – yet especially syrup – is grim and pointless. Combine topping sugar and cinnamon into bowl – set aside. Grease holes of mini donut pan with cooking spray and preheat oven to 180C. Shift flour, baking powder and soda into bowl, then add wet ingredients. Beat lightly but thoroughly with a silver spoon. Transfer mixture to a Ziploc bag, snip off the corner and pip each hole ¾ full. Bake for 6-8 minutes [depending on your oven] then remove to a cooling rack. 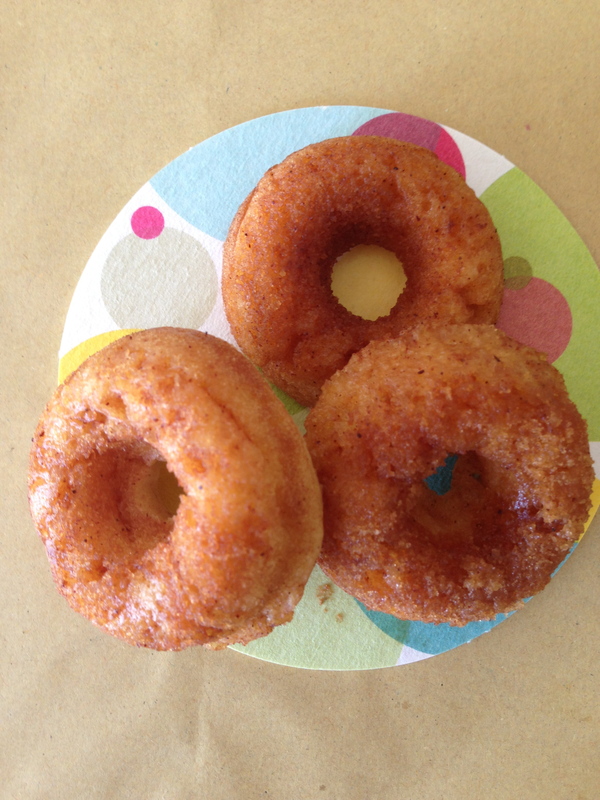 Use pastry brush to cover warm donuts in melted butter then dredge in topping mix. Tooting my own horn here – these were fab! Baked not fried …. I think I had better try these!! Yum! Oh, I know everyone in this household would love these! I’ve been going back and forth about getting a donut pan. Now, I just have to! I’m the same way. I pick it up physically and examine the pan in the store multiple times, trying to decide if it’s going to be used a lot, or become one of a growing pile of bakeware items that I keep in storage. Then I see posts like this and realize I should just get one! If I lived in maple syrup county I’d be the size of a house 🙂 I love the stuff. Donut holes sound fab! Donut pans will change your life 🙂 These are gooood! Drooling over these – and yes, real maple syrup. Imitation should be outlawed! Keeping my eyes out for a donut pan. Cinnamon and maple–yum! These sound great! Cheers! I’m cinnamon biased but they are v yummy. I’ve been toying with the idea of making baked donuts for forever but have never gotten around to buying a pan–but these are so easy I could definitely get addicted to making them! You *nned* a pan – stat! I got mine from Sonoma-Williams in SF & use it all the time. I love donuts! I’v got to try these. Thanks! These are so quick & simple – give ’em a go, you’ll be glad you did! Very healthy choice of doughnut version love it! very creative bravo! awww, ta! Healthy & donut = winning combination! Cinnamon and MAPLE?! That sounds like a winning combination. I can only imagine what they smelled like. The smell was incredible, I must say [the taste was superb 🙂 ]. I may have to try these soon. These look delicious! i agree with imitation maple syrup it’s not good! Easy and baked, I love it. Baked = yay. I’m too scared to do deep frying. These look delicious- I absolutely love doughnuts! Thanks for sharing this brilliant recipe! Oooh, thanks for the sweet words! I hope you try them, they are v yummy. Really, you do need a doughnut pan in your life. There are so many fab recipes out there! My mum and I are absolute suckers for cake doughnuts AND maple syrup! Definitely bookmarking your recipe and making it for a mid-afternoon milk break! I’ve been thinking about buying a doughnut pan…this gives me some incentive. 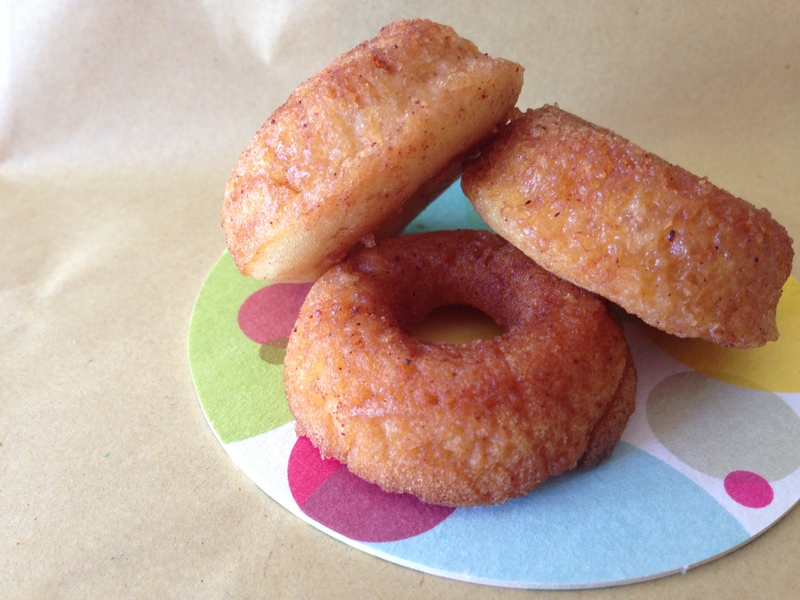 oh gosh, hot cinnamon sugar donuts! They look wonderful, delicious – I am going to try these. 🙂 I printed your post thank you! Did you see my post today, Hot Fudge Cake! These look pretty tasty!Pure baked heaven! I have to get me a donut pan now!